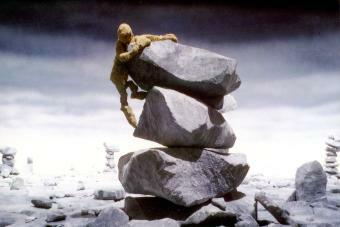 QUEST is a mixed-media, stop motion film which uses materials not commonly used in animation. In a quest for water, a sand puppet leaves the sand world in which it lives. It wanders through other worlds made of paper, stone and iron, following the sound of dripping water. In the end, the sand puppet manages to reach the water... in a very tragic way. Thomas Stellmach was born 1965 in Straubing. He graduated from the University of Kassel with a degree in Visual Communication. Since 1982 he has produced 16 animated films and teaches at the Film Academy Baden-Wuerttemberg in Ludwigsburg and at the University of Kassel. In 2001, he founded the animation company Lichthof Film & Animation with P. Lemken and J. Bode. He won an OSCAR in 1997 for the puppet animation film Quest. His other award-winning films include: Weeds (short animation, 1990), Small Talk (short, 1994), Old Super Lady (short animation, 1994), and Chicken Kiev (short animation, 2000), among others. Tyron Montgomery was born in 1967. Also active as a cinematographer, visual effects specialist, he worked on the The Last Man Alive (Die Gruene Wolke, 2001) and has directed the OSCAR-award winning Quest (1996), and Our Garden (1998).